The Ware for October 2014 is shown below. Very busy with getting Novena ready for shipping, and Chibitronics is ramping into full holiday season production. And then this darn thing breaks! Well, at least I got pictures to share. This entry was posted on Saturday, October 18th, 2014 at 7:32 pm and is filed under Hacking. You can follow any responses to this entry through the RSS 2.0 feed. Both comments and pings are currently closed. Based on form factor and repetition, I’m going to guess an LCD column or line driver. 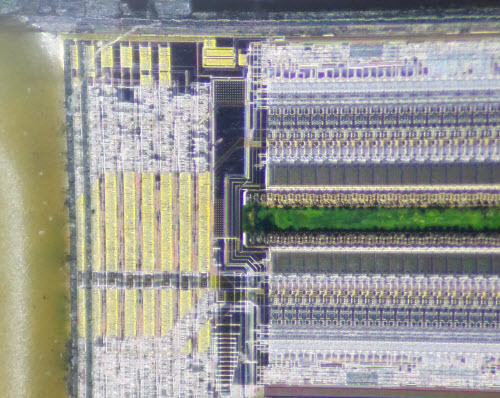 Going to guess this as well, chip-on-glass LCD driver from your phone? How about an old school stick or wand scanner head? It looks like the rows of dots are the lights that light up the object (paper) being scanned. I think the contacts on the side are the signal handoff to a tiny ribbon cable. I’ve taken several of these apart before. 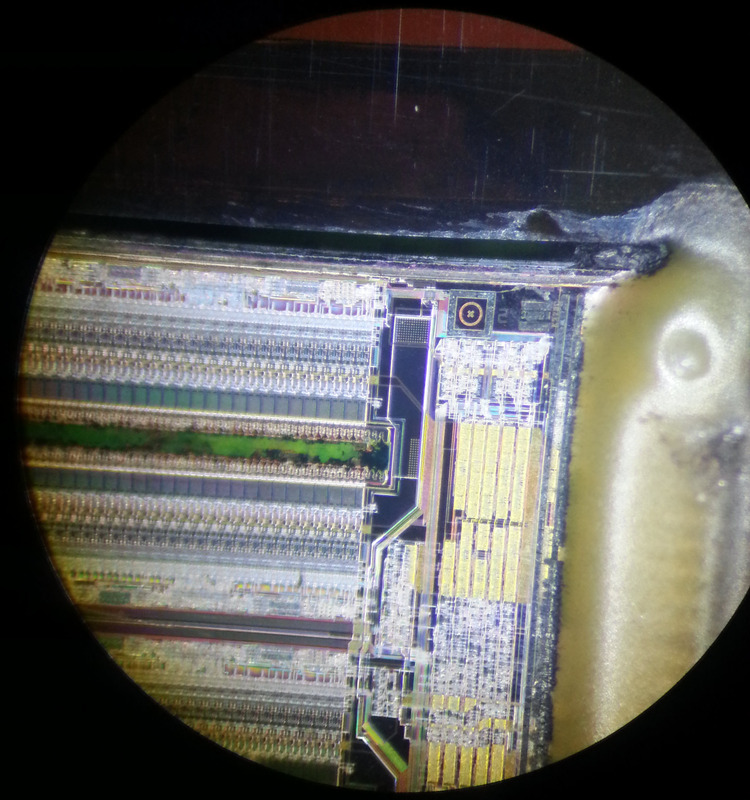 Is this perhaps a circuit on the flexible pcb found on the front of an ink jet printer head? This would be the piezo layer which is below the part that one can see where the ink comes ot of. 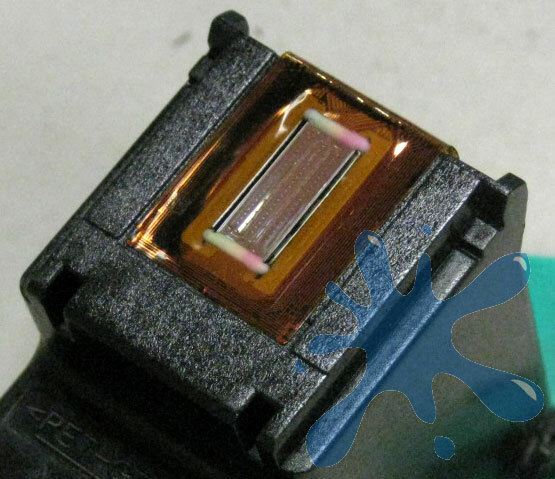 This is probably the hybrid piezo/silicon IC that is the actual printhead of an inkjet printer. 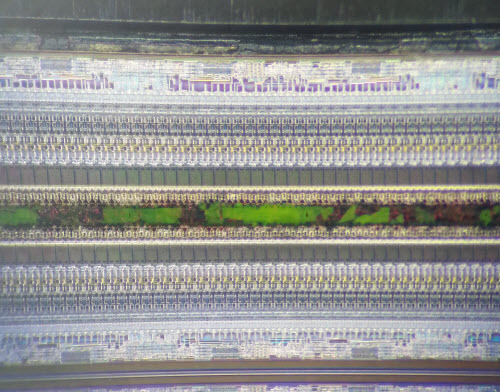 On the first and last photos you can see where it bonds to the flex PCB, while the green stuff is presumably the row of piezo actuators (with ink residue?). On the first photo you can start to see a second row of everything below, which is why this is clearly not a single-line thermal printer or CCD scanner. 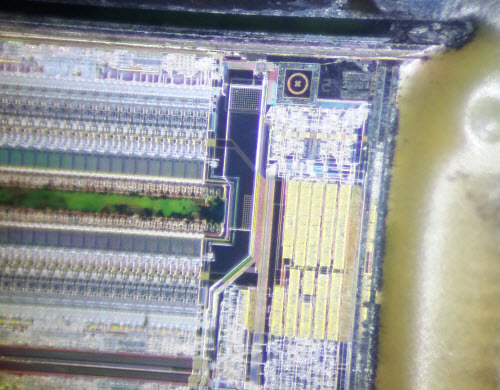 Also, ISTR (from having destroyed a print cart or two) that the active element tends to be bonded to the flex PCB on the short edges, which matches this. Might also be resistive instead of piezo, of course. From the different colors of the two visible rows, and the fact that there are at least two to begin with, I’m going to guess this is a tri-color cartridge. And from the short-side contact arrangement, I’m going to guess HP. The element from a specialized thermal transfer printer that sticks routes on pcbs? Fingerprint reader, perhaps…? Like the type used in older ThinkPads. HP ink jet colour cartridge. 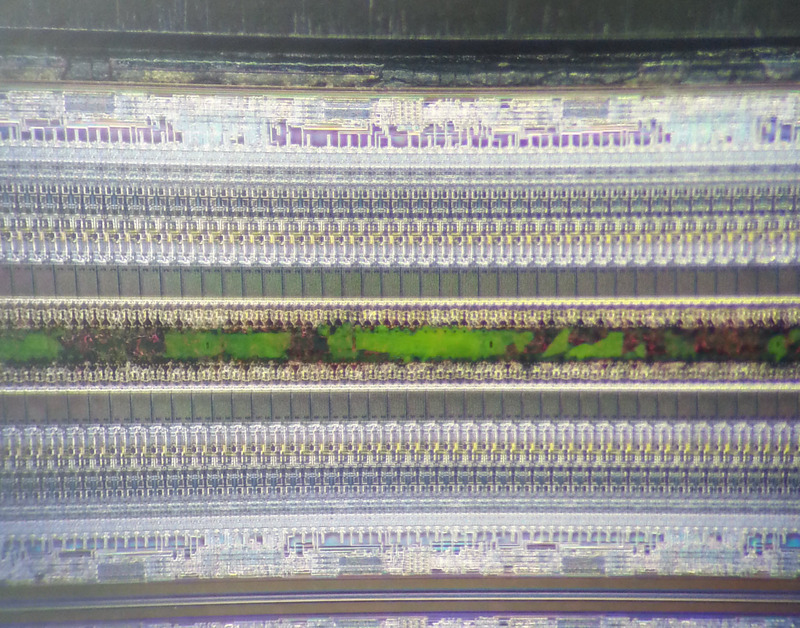 The chip goes behind the flex PCB that has the contacts (and the ink jet holes). This chip has been detached from the flex. 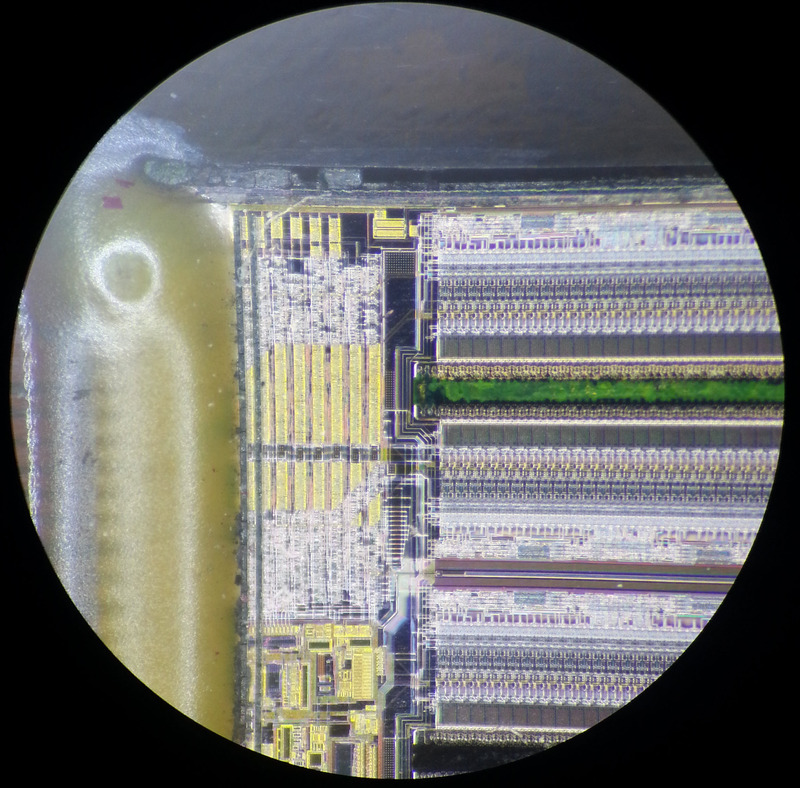 There are physical slots in the chip to let the ink through to the front side where the drivers (which use a thermal expansion shock wave to eject the droplets). Awesome! I mean, with my Chumby reduced to being a somewhat expensive doorstop, I can’t wait for something new from Bunnie! I still have a few Chumby’s (BesyBuy version) and used them for random hacking and as a Pandora radio player for the stereo in my garage. Works great for me and even as something “abandoned” it has worked for years now as an internet radio player. I guess it depends why you initially purchased it, for me it’s the best bang for the buck I’ve gotten out of many random technology purchases. The fact that it’s still plugged in and used daily is a testament to that!